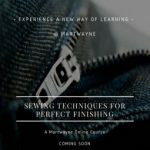 Learn how to create clothes with a perfect factory finish. Clear instructional videos perfect for beginners as well as advanced sewers. Learn from the comfort of your home. Earn a Training Certificate on successful completion of the Course.